In FIRST Frenzy: Raising the Bar, each match was 2 minutes long. The carpeted field was 24 feet wide by 48 feet long; across the center is a plastic toped platform 4′ wide and 8′ long 1 foot above the floor across this platform is a steel pipe across two vertical poles making the Pull up Bar which stands 10′ off the floor. The lower decks are 6 sided polygons on both 8 foot sides of the Upper Deck they measure 8′ x 8′ and are 6 inches above the floor at each end a set of stairs 1.5 inch rise by 3 inch run. Both Lower Deck’s have a 28 inch diameter octagonal Stationary Goal made of 2 inch PVC posts the five goal posts closest to the Upper Deck stand 8 feet tall the other three stand 6 feet tall. Each alliance has a Mobile Goal which is a 36 inch by 36 inch hexagon mounted on casters each one also has a 28″ diameter made of PVC poles at each vertex, the goals stand 4 feet tall. The game is played 2 vs. 2. The first 15 seconds are the autonomous period where the robots have to control them selves and try to knock one of their alliances’ two 13 inch yellow ten point balls off their tee which will release 18 13 inch purple 5 point balls from the ball release mounted above the driver station. If they could not do this by the end of the autonomous period the balls would drop at the 45 second mark in the match. During the remaining part of the mach the drivers would try to get as many of the 5 point balls to the human player so they could try to toss them into the goals. The robots could also pick up one of three 30 inch multiplier balls and cap a goal with it. At the end of the match robots would try to hang from the pull up bar. 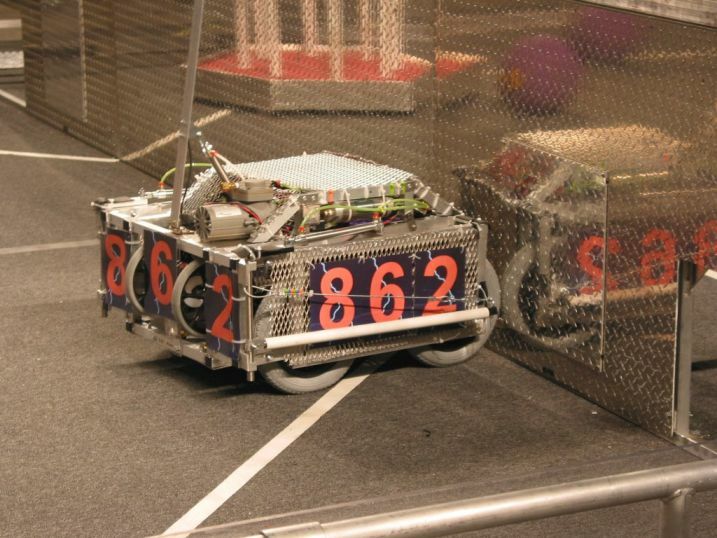 A mach was scored by adding up all the 5 point and 10 point balls in a goal if a multiplier ball capped the goal the point total for that goal would double both goals were added together and an additional 50 points were awarded for each robot on your alliance if they were hanging from the bar at the end of the match. Schools: Salem H.S., Canton H.S., Plymouth H.S., Plymouth Christian Academy, Catholic Central H.S. History: The 2004 robot was originally designed with a complex Tri-Star drive train. The Tri-Star system used 12 – 6 inch pneumatic wheels divided into 4 sets of 3 wheels arranged into triangles which made up our carriers. The system works but not well enough to be used in time. A new drive train using 12.5 inch pneumatic wheels was designed and built into the frame designed and built for the Tri-Star system in only 3 hours at our first regional. The robot also featured a pneumatic powered ball poker and two pneumatic powered wings that under went several redesigns during the build season. Loki was referred to as “Rolling Thunder” by the announcer during one match. The team attended the Great Lakes Regional in which we placed 28th out of 62, while also attending the Championship Event in Atlanta, Georgia where we placed 56th out of 73 in the Newton division. The team grew member wise to 73 registered students. The Robotics Parents & Mentors (RPM) was formed before the season started to help ease the workload of mentors by taking on the tasks of arranging travel and making hotel reservations, ect. This was the first year the Brian Graham Mentor Leadership Award (BGMLA) was given out. It will be presented to one mentor a year who shows exceptional dedication to the team. For its first year it was presented to two mentors: its’ namesake, Brian Graham, and our teacher/ advisor, Mr. Obsniuk, who has been with the team since its start in 2000.